Google has been in the news this last week. First with the news on Google +. While I've always thought the technology of G+ was great, engagement sucked. 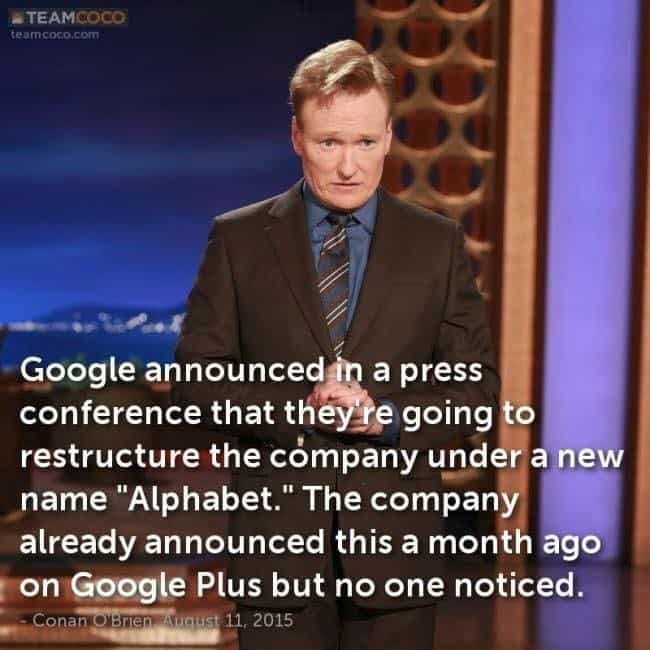 When Conan O'Brian makes a joke about it, you know you're toast. They have stopped forcing anyone with a Google login to have a Plus account so we know they have realized the inevidable. Google Local and Maps will continue to be valuable to businesses and let's face it, Google Hangouts which is a direct result of the G+ experiment is amazing. That said, so few people are interacting on G+ it's pretty much worthless.. There is an articlal on the Business Insider that goes into what went wrong. One of the biggest issues was that it seemed like a reaction to Facebook. via What happened to Google+? – Business Insider if you want to read their article on this. Also in the news is Google's restructuring–calling the new umbrella company Alphabet. Aaron Levie, Box’s outspoken, 30-year old CEO, went on a podcast with USA Today on Thursday, and dropped his two cents on Google’s new business structure, largely endorsing the move as something that will give Google cofounders Larry Page and Sergey Brin much more flexibility.